IF you thought a factory that turned out trim and effective race bikes in the 1970s – winning three 125 and one 250 world championships – could make a decent-looking road bike, you’d be wrong. The Morbidelli factory also produced woodworking tools, but there was little it could do to re-shape this misguided minger. Launched in 1994 to universal disappointment, this was another machine that was beyond rescue by " facelift " . Bikes have survived total engine malfunction and survived to enjoy long and happy lives, yet nothing damages the reputation of a bike more than accusations of extreme ugliness. 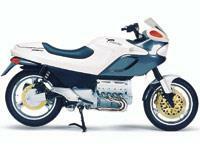 The 850cc V8 engine was, by all accounts, a gem. But, sadly, that precious stone was mounted in a chassis that was laughably short of what it deserved: Like grafting Caprice’s face on to Vanessa Feltz's body. Semi-traumatised by the vicious reactions to his " baby " , Giancarlo Morbidelli soon lost enthusiasm for making motorcycles. Some poor unfortunates who saw the bike in the metal almost lost enthusiasm for life itself. Australian engineer Ian Drysdale is close to completing his second road-going V8-based road bike. Fancy a V8 drag racing bike?